Today, BizIQ Local Listings Supervisor Danni Petersen, came into the BizIQ Marketing Office and gave me some news about Google and transferring ownership of Google My Business Listings that I didn’t want to believe. I’m so mad I could spit, swear, and break everything in the office! Why? Remember, a few weeks ago when I wrote this article about how to fight spam and fake listings on Google Maps? Everyone at BizIQ is passionate about educating small businesses on the importance of their Google My Business listing and why the listing is an integral part of their local marketing efforts. 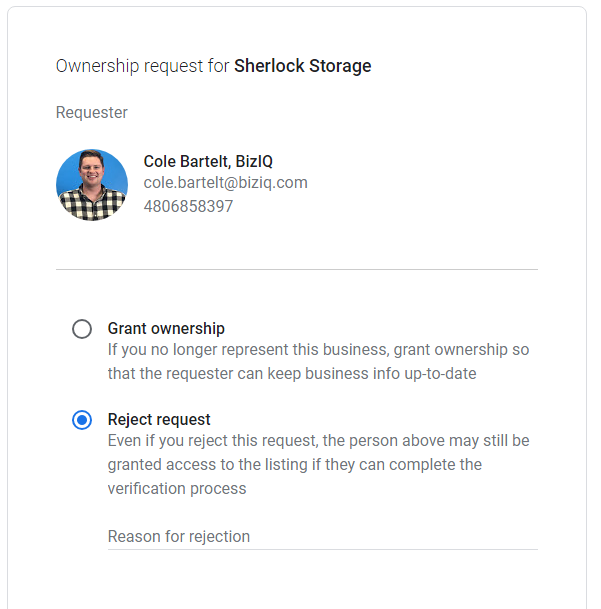 I’m angry because to me, it appears that Google is approving Google My Business ownership requests of verified listings even when the current owner rejects the ownership request. Are they just giving verified listings away? No, they’re ignoring the fact that the business owner rejects the Google My Business ownership request, and then the transfer goes through. That’s a problem because no matter how you look at it if this happens to you, you’ve lost your Google My Business listing. So how did Danni discover the problem? At the end of the day on Thursday, Sept 13, 2018, with the help of BizIQ Sr Local Listings Specialist, Cassidee Gregory, Danni noticed that we had lost the listing of one of our clients. When we called the client to check if they’re transferred the ownership to someone else, they told us, no, and they had no idea who the person is who has stolen their listing. We contacted our client to see if they knew the person listed in Google’s email, and they told us, they did not. We rejected the request within 1 hour. Google allowed the ownership transfer anyway. And it was extremely easy for the person who stole the listing to do even though all they listed for contact details were a first name, and a telephone number that is just the number 1, as well as an email address of random numbers and letters at gmail.com. At some point during the last 10 days, someone called our client’s business on their business line. During that call, they convinced someone to give them the Google verification PIN code, probably by either claiming they were Google or claiming they were their marketing company. They entered the verification code. At some point, Google verified the listing, and it was successfully taken over by the person who requested it. That’s right. Google does not make it hard for anybody, including scam artists to take over your Google My Business listing at all. 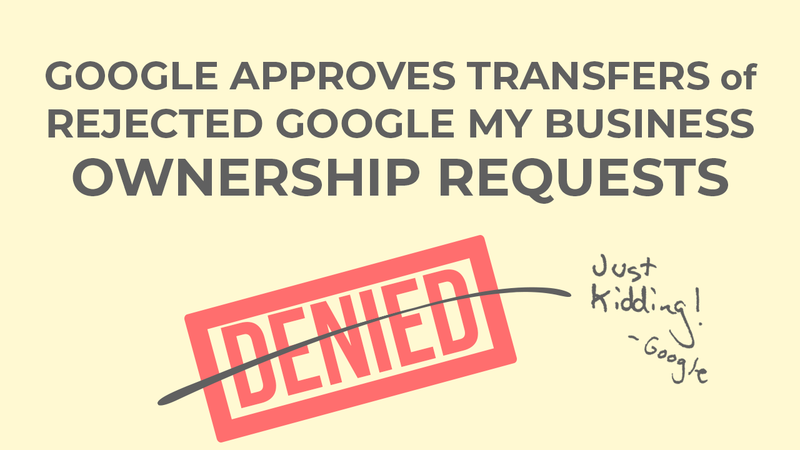 Danni wasn’t going to just let someone take over our clients’ listing, so she called Google My Business Support. What did Google My Business Support advise? Danni called Google My Business phone support 3 times and spoke with 4 different people before she could get anyone to listen to the problem and even act like they were willing to work on fixing the issue. The first person she spoke to was dismissive and told Danni there was nothing Google could do to help. That’s it. The third person she spoke with was very sympathetic and transferred Danni to a supervisor. The fourth person she Danni talked to was more accommodating and acted like they took this problem seriously. He told her that he has a meeting with the Google My Business Product Team and they would discuss how they could create a process that would protect people who claim, verify, and manage their Google listing the right way. Google My Business promised to call Danni and let us know what Google came up with as a solution. But what does Danni think Google should do to fix the problem? What should Google do to solve the problem? When Danni and I were working on outlining the details for this article, she came up with some ideas for how Google could make it harder for someone to take over someone else’s business listing that would protect people who follow Google’s guidelines. 1. Can Google My Business Support get verbal confirmation? Google should call the business line and speak to the business owner, not just any employee who answers the phone. Google used to do this but eliminated this step awhile back. 2. Is there documentation that shows the transfer was authorized? 3. Was the initial request denied? Google needs to look at the original ownership request. Was it denied within 24 to 48 hours of the time Google sent out the email? They also need to look at why the request was denied. For example, BizIQ always includes a note that says that BizIQ is actively managing this listing. 4. Is the business being actively managed? Google likes to say that if a listing is being actively managed, it’s a safeguard against someone just taking over your listing. In the case of our client, we’ve been actively managing their listing for 2 years. We’ve continued to optimize it with new features as Google has added them. Someone was still able to get Google the listing. 5. Is the business using other Google products like Google Ads? Google needs to check to see if your business uses other Google products that are tied to your listing such as Google Ads or Adwords Express. Allowing someone to take over your Google listing even after you reject the request, means any ads and analytics that are tied to your business listing won’t work correctly. I’ll let you know what Google tells Danni about what they plan to do to fix this issue. Right now the only advice Google gives is to submit an ownership request for the listing that someone took from you. Of course, the person who stole your listing can reject your request. In that case, you might be able to appeal. However, Google doesn’t always include a link to appeal their decision, and then you’ll have to get help from a live Google representative by submitting a request for one to call you. Even though agencies and local online marketing companies can also have problems with shady companies and con-artists targeting the client listings we manage, we can often get answers from Google faster than most small businesses can on their own. If something similar is happening to you, or you have questions about Google listings, I urge you to reach out and contact BizIQ.